1. Preheat oven to 300 degrees F. Prepare a baking sheet covered with foil or parchment. 2. In a large bowl, stir together oil and sugar until blended. Mix in vanilla, then beat in eggs. 3. In a separate bowl, combine flour, baking powder, and cinnamon. Gradually add flour mixture to the egg mixture, stirring to incorporate. Fold in chocolate chips and nuts. (I used whole pistachios without cutting them up, and it worked fine, but you can chop them up for a finer texture). 4. 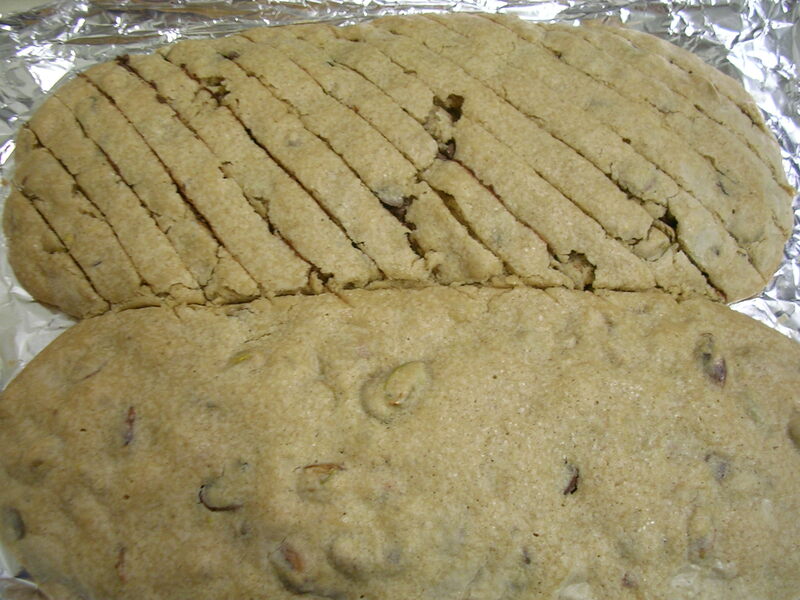 Divide the dough in half and form two logs about 12×2 inches each, laid out on the baking sheet several inches apart from one another (the dough will be very sticky). To handle the dough more easily, I suggest chilling it for 15-30 minutes, and wet hands with cold water when touching the dough. 5. Bake for 35 minutes, or until logs are light brown. They will spread a good deal in the oven. Move logs to a cutting board and as soon as you can, use a sharp non-serrated blade to cut the logs on the diagonal into 1/2 inch thick slices. (Reduce oven to 275 degrees F while you are cutting the logs). 6. 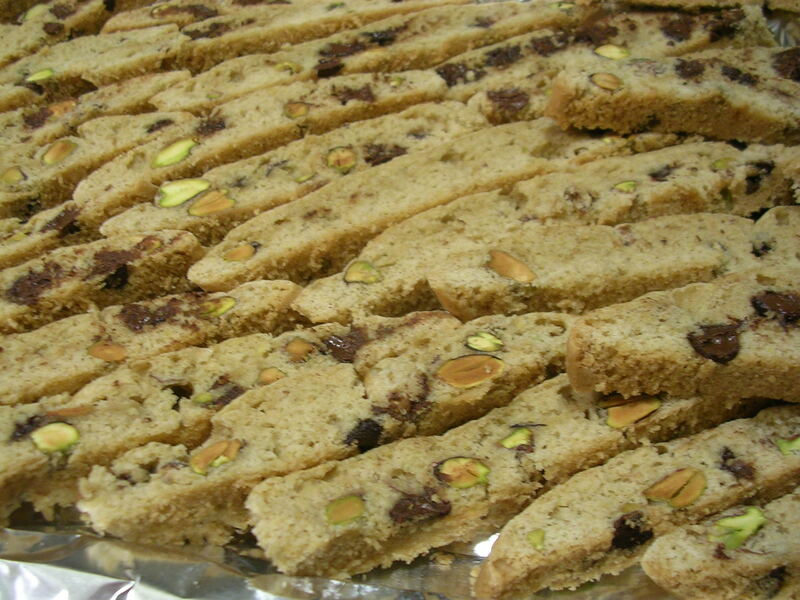 Carefully move biscotti slices back onto baking sheet, laying them on their sides. Bake again for about 30 minutes, or until the biscotti feel firm to the touch – they will continue to firm up as they cool. Remove and cool completely on a rack. Store in an airtight container. 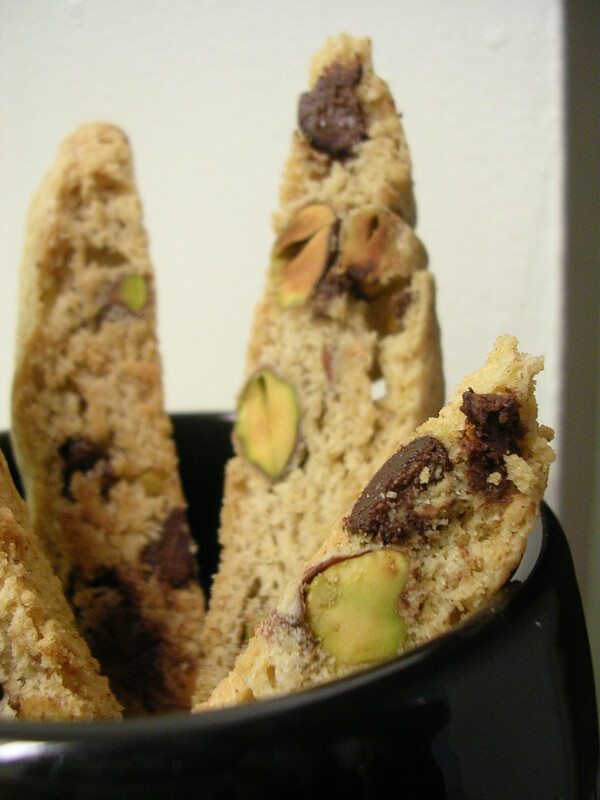 I didn't have the time to pursue it, but lots of people like to decorate their biscotti with melted chocolate: either by drizzling it over the biscotti or by dipping tips of the biscotti into melted chocolate. Either way, it sounds like a great snack! I refrained from adding chocolate on top because I already had chocolate chips in the biscotti, and I figured the chocolate would melt into my hot tea when I dunked the cookies in, and that would be odd. So they're not as pretty as they could be, but I loved the flavor! It was not at all too sweet, with a great cinnamon scent and a roasted nutty flavor from the pistachios. They were simply divine dipped in my pomegranate flavored black tea, what a treat! These cookies keep for a very long time too, which is great for me since I now have 32 and can enjoy them with my tea for a long time without having to make more :) Since they store so well, I'm sure they'd make a great gift as long as they were packed properly (the tips are brittle so if you don't pack them correctly they might break off during shipping). I only wish I had a beautiful clear jar to store my biscotti in, just like I see them at coffee shops. But alas, they'll be sitting in my tupperware until I can afford the luxuries of a real kitchen. This entry was posted on Wednesday, March 5th, 2008 at 7:35 am	and posted in baking, desserts, Italian, recipes, Uncategorized. You can follow any responses to this entry through the RSS 2.0 feed. ~drools~ I saw you had updated your blog and thought "oh my, Lucy's cooking again! Hello weight gain!". LOL I LOVE pistachios but it is so rare that I see them in a recipe! This looks positively divine, just like all others. I cannot tell you how very much I enjoy this blog! Interesting that the recipe uses olive oil… I would think it would have too strong a flavour, but perhaps a really light version would taste okay. Did they have any olive oil flavour at all? I usually use butter for my biscotti (because I am unhealthy and believe that baked goods should make good use of butter and eggs).Also, I think when you do the second drying step, you could keep the oven at the higher temperature, but only bake them for another 15 minutes or so. It all depends on how crunchy you like your biscotti! I didn't taste the olive oil at all in the end product, but some reviewers of the original recipe mention liking the olive oil flavor. I think light olive oil is probably mild enough for these cookies, but vegetable oil is always a fine substitute. While I was researching biscotti, I read that butter is not recommended, since it can go rancid rather quickly and biscotti is usually stored for a good while. And you're right, a higher temp for a shorter period of time is probably easier. I was trying to follow the original recipe, which called for 10 minutes at 275 degrees, but my biscotti were still soft at that point. So I let it go another 10 minutes… and another 10 minutes… until it was firm enough for my liking haha. Interesting! I've always used butter for my biscotti and it seems to work just fine. 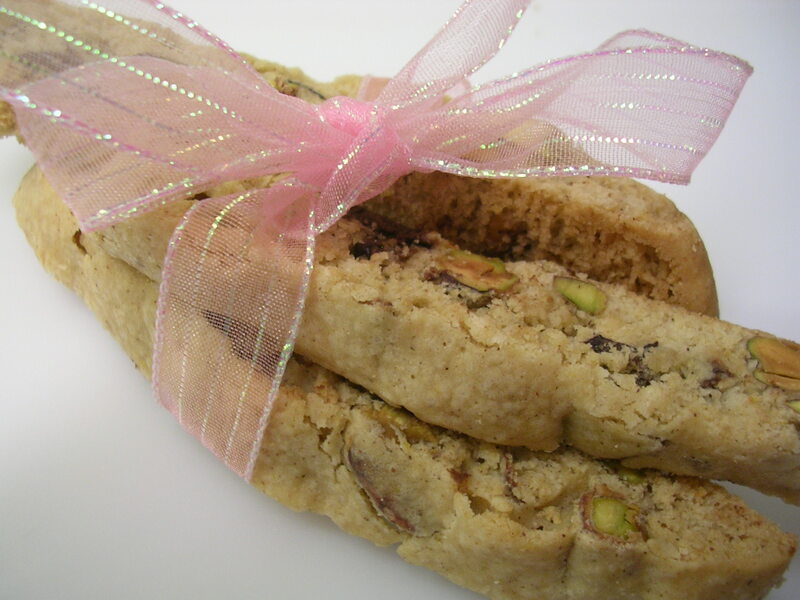 Then again, my biscotti don't usually stick around so long since we tend to bring them to parties or give them away as gifts. So interesting… I was not aware of the butter possibly being a problem, and now I'm going to have to do some research too!The dryness of biscotti is such a personal preference. I really like a dry cookie since I'm a dipper, so I tend to dry for 10-15 minutes or until the crumb looks just right. Ha… I think the more you bake biscotti, you'll have a better idea of what the right dryness is just by sight.